This morning we received an informative email from blog readers Anne & Colin (nb Heather Ray) advising they have previously purchased plug-in thermostats from B&Q and that they were less than the £35 I quoted. A quick trip to the B&Q website confirmed it was possible to purchase a suitable thermostat for £19.38 (plus p&h). The thermostat plugs into the 240v wall socket and the heater then plugs into the thermostat. 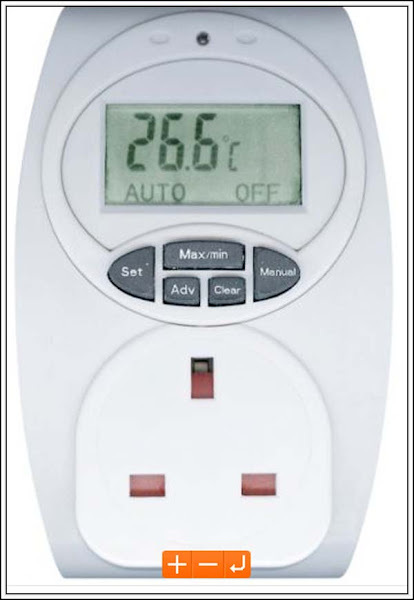 The thermostat then controls the activation of the heater based on the configured room temperature. Now I need to do a cost benefit analysis to see if the cost of the thermostat will be recovered by the saving in electricity. The first factor to consider/establish is the cost of a unit of electricity. that’s very simple to do as all the energy companies provide their tariff information in a clear, concise and simple format [cough… splutter] Liar..Liar… Your pants are on fire!! OK, it’s not that easy. Using superior logic and ancillary evidence. I guessed a unit of electricity costs approximately 15p which would mean the thermostat is worth slightly more than 129 units of electricity. So we would have to save at least that much electricity to make the purchase financially worthwhile. Assume we would run a 1kw fan heater 16 hour daily for the full four months over winter. In order to ‘break even over winter the thermostat would need to ensure the heater was switched off for 7% of the total time thereby avoiding overheating of the boat and wasting electricity. Actually my preference would be to leave the heater running 24/7, but set the thermostat to a lower temperature during the periods we are asleep or not aboard. My logic is; it’s more energy efficient to slightly alter the temperature rather than move the temperature from one extreme (very cold) to another (comfortable). Assuming my electricity consumption calculations are correct and the price of 15p is right, then we should consume approximately £280 of electricity over winter in heating the boat. My estimated diesel consumption running the Lockgate refleks is 200-300mls/hr and the cost of domestic diesel was 80p/ltr. The estimated cost of running the Lockgate is approximately 16p/hr @ 200mls and 24p/hr @300mls. Just to check, I’ve been to the Lockgate website to view their diesel consumption figures. They state min 180mls and max 540mls. We’ve been running the Lockgate just below the lowest setting so it’s probably using 180mls/hr which equates to 14p/hr. This means it’s almost equal to my estimated cost of a unit of electricity. There is one other consideration. The Lockgate appears to emit more heat on a minimal setting than a 1kw electric fan heater. It probably emits too much heat…. despite being on the lowest setting! So is it to be electric heating or diesel? Maybe a combination! Hi Jan - I'm with you! Tom, why is there a need for an external thermostat anyway? Fan heaters usually come with their own internal thermostats which can be turned up or down to make them cycle on / off to create a comfortable room temperature of your choice. As for us? We go to the boat and turn on the diesel heating for ease, or light the stove if it gets very cold - without any further consideration, except I often think of how much cheaper it is living at the boat instead of at home! My logic is that if the heater has a built-in thermostat then it is measure heat at the source. I would have thought it was more effective to measure the temperature at the opposite end to the area you are attempting to keep warm? I assume it's cheaper to live on a narrowboat compared with a home because the former is considerably smaller? Also Tom living on a narrowboat just like living in a motorhome or caravan you don't have costs such as rates, insurance, water rates etc, so the overall costs must be much lower on the boat than living under bricks and mortar. This should give much more discretionary income to spend on heating. The boat has to be insured and the annual license is similar to property rates. On a floorspace ratio I would suspect the costs are similar. However living in a smaller area with less 'facilities' should be cheaper. And then there is the 'convenience factor'.... Electricity arrives to in a wire whereas diesel requires collecting either by moving to a pump or by sack trolley. In your calculations I note that you are working on a per unit charge. When using shore power in a marina is this the way that electricity is billed or is it a flat per day rate regardless of consumption akin to that in caravan parks in NZ? Based on our very limited experience of shore power connections in the UK I suspect the electricity is paid at a unit rate. In other words Blogger said it had just lost the contents of my long comment. It's a good job I've met Blogger before and I'd typed my comment in Word so I can cut and past it again. You need to check the cost of a unit of electricity at the marina you are booked into. Sherborne Wharf charge 18p per unit – and more for short term moorers – and a standing charge on top of that. We use four heaters from B&Q bought at £9.99 each with built in thermostats. Three are spread along the length of the boat so we can shut intermediate doors etc. and still keep warm. One is in the engine compartment. The boat next to us at Sherborne Wharf had a burst calorifier in their engine compartment two winters ago, despite being live aboards, because it got so cold overnight in the engine compartment. They are set to keep the boat frost free during the winter when there’s nobody there. Turning the thermostats up when arriving soon makes the boat warm with three along the length. It also means that if one fails to work the others should still keep the boat frost free when we are not there. They aren’t fan heaters. A couple of ex desktop computer fans, with resistors in series to reduce their speed to tick-over, and fed from the 12v roof lights, keeps the air circulated with no noise. And these can be used to circulate the warm air from whatever heating system you are using, not just the electric. You also need to know the maximum power you can draw from the marina shore supply. Some marinas quote 16A, but forget to tell you that’s shared between four boats. We get 16A to ourselves which is ample to supply all four heaters normally set to ½kw. When I go to the boat and turn them all on and up to 2kw each to boost the heat for ½ hour, the Victron units supply the extra from the batteries. That ability to boost the heat quickly from more than one heater on your return would enable you leave a lower level of background heating when you go out for the day and help pay for them if you can do the maths. You make some valid points. We do need to know the cost per unit of electricity and the maximum amps from the supply. The Victron can supplement the 240v if necessary but I would prefer to have the Victron set on charge rather than Inverter. We managed last winter with the fan heater(s) not having a thermostat. But then we weren't paying for the electricity. On a more serious note..... Are you restricted in the maximum amperage you can draw from the shore power? 16 amps on the shore power. I read somewhere that an insurance company knocked back a claim for a burnt out boat, because they left an oil fired radiator unattended! For us boat heating is the hurricane for about 1.5 hours in the morning to heat up the rads and hot water, then log/coal fire. one of our neighbours on the marina runs the immersion heater on electric 24/7 their electric use is about £7.00 a week. You may have 16amps on the socket but are you actually sharing the 16amp cable to a bank of sockets or can each boat simultaneously draw a maximum 16amps? I would never leave an electric heater unattended. But I assume there are many summer boaters who do in an effort to avoid frozen pipes, etc. We will probably leave the immersion heater in the calorfier on 24/7. It doesn't take much electricity to maintain water temperature and it will provide a very small amount of warmth to the engine bay. I suspect our electrical bill will be approximately £50 per month.